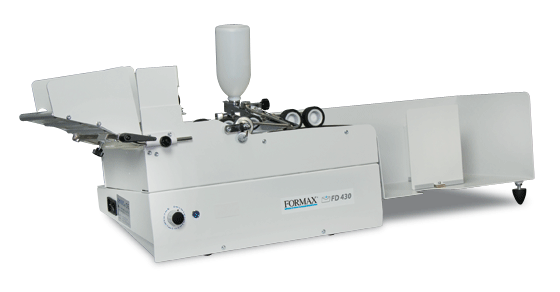 The Formax FD 430 Envelope Sealer closes and seals envelopes in a single pass. Simply place a stack of envelopes in the infeed tray, choose a processing speed with the adjustable control knob and in seconds, envelopes are sealed and ready for the mail. 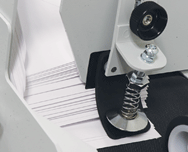 Users can seal envelopes up to 9.75” wide, up to 16 mm thick, at speeds up to 18,000 envelopes per hour. Standard features include an adjustable envelope separator to ensure accurate feeding, a large outfeed tray, heavy-duty metal construction and a precision moistening roller. The flap closing bar allows users to load envelopes in a standard stack or nested with flaps open for even greater efficiency. Forget the days of hand-sealing envelopes, and let the Formax FD 430 seal your mail in the blink of an eye.